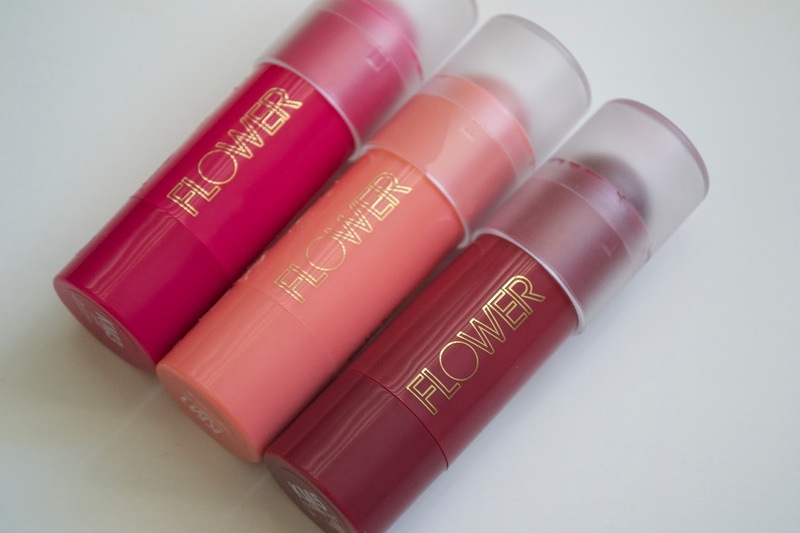 Flower Beauty has came out with some new products at Walmart and I decided to give these a try. These are made to use on your lips and cheeks to give pigmented color. There are 5 shades available and a good range of colors from light to dark. These are crazy pigmented! See swatches and photos below! Flower Kiss Me Twice Lip and Cheek Chubby's versatile formula provides full coverage for lips and sheer buildable coverage for cheeks. It gives cheeks a romantic, rosy glow in a pinch. Spherical silicone powder and ceramidone reduce the appearance of fine lines and wrinkles and help plump the skin. Soft focus complex provides optical skin smoothing. The first two shades (Can't Re-Fuchsia and Apricot-a-lot) were swatched only once! The last shade (Raisin The Roof) would of been swatched once as well, but it bought broke as soon as I opened it. So I had to put it back the best I could and then swatched it a few times. But either way they are all super pigmented. I preferred applying these on the cheeks more than the lips but pigmentation was great for both. I loved the way that they worked on the cheeks. They start off creamy when you apply them and then it felt like powder as I was blending it in. Perfect for use as a blush, and I really enjoyed how much color they had. They lasted all day long on the cheeks and were buildable to how pigmented you would want them. Using them on the lips was a little different experience. I think because of the powder like finish, it felt like I had baby powder on my lips. The shades though are so pigmented on the lips and the colors last a few good hours. I definitely see myself using these more for my cheeks because of the finish. Flower Beauty Kiss Me Twice Lip and Cheek Chubby retails for $9.98 each and can be found at Walmart stores or online.